Second Act is a 2018 American romantic comedy film directed by Peter Segal and written by Elaine Goldsmith-Thomas and Justin Zackham. It stars Jennifer Lopez, Vanessa Hudgens, Leah Remini, Annaleigh Ashford, Dan Bucatinsky, Freddie Stroma, Milo Ventimiglia, Treat Williams and Larry Miller, and follows a woman in her 40s who pursues a second chance at a corporate career, after a friend creates her a fake resume and credentials. The film was released in the United States on December 21, 2018. It received mixed reviews from critics and grossed over $72 million worldwide. Maya Vargas (Jennifer Lopez) is the assistant manager of the Value Shop store she has worked at for the past 15 years. During that time she dramatically improved sales, customer relations, and general store culture through her intuitive and innovative methods. She awaits a store visit by an executive of her company, Mr. Weiskopf, anxiously hoping to be promoted to manager. Her boyfriend Trey (Milo Ventimiglia), co-workers, and several regular customers all assure Maya she’s guaranteed the promotion, but instead she’s passed up in favor of Arthur (Dan Bucatinsky), a non-local company employee with an MBA from Duke. Mr. Weiskopf explains that while he values Maya’s dedication and success, she only has a GED and no college degree, which makes her ineligible for the promotion by company policy. Maya is bitterly disappointed but reluctantly agrees to stay on as Arthur's second-in-command at the store. Later that day, at her best friend/co-worker Joan’s (Leah Remini) house, her friends and Trey throw Maya a surprise 40th birthday party. Joan's tech-savvy son, Dilly, overhears Maya's frustration about being overlooked due to her educational shortcomings. Maya soon unexpectedly receives a call from a major retailer, Franklin & Clarke (F&C), for a job interview. Surprised that CEO Anderson Clarke personally wants to meet her, Maya nonetheless manages to impress Anderson. Unsure why she would be regarded so highly, it is then revealed that Dilly gave her background a dramatic makeover over social media, digitally fabricating for her an enhanced background with a Harvard education, high-ranking past corporate jobs, and an exaggerated upper-class life. Anderson’s daughter, Zoe (Vanessa Hudgens), who works under her father, displays a dislike and professional jealousy towards Maya, but Anderson is still impressed with Maya and offers her an executive consulting position at the company. Maya is reluctant to accept the offer since her so-called background and credentials are all lies. This changes when she becomes fed-up with Arthur’s obnoxious and clueless mismanagement of the Value Shop; she dramatically quits the store and accepts the offer to work at F&C. Meanwhile, Maya's personal life begins to suffer. Trey has been a wonderful, loving boyfriend in the several years they’ve been together, but is deeply hurt to realize that Maya has no desire to have a family with him. Feeling that she has only allowed him to see the person she wants him to see and not who she really is, he breaks up with her. On Maya's first day at F&C, she is given Hildy (Annaleigh Ashford) and Ariana (Charlyne Yi) as her assistants. At a company meeting that morning, she is introduced to the rest of the company and asked to share with them her thoughts on how to improve sales. Maya had earlier commented that their skincare product wasn’t selling well due to the fact it wasn't truly organic (although the label claimed it was), and that customers were put off by the perceived deception. Zoe is offended at the comment and challenges Maya to make something new, while Zoe attempts to modify a pre-existing line to be more organic. Anderson agrees to the competition and gives them three months to present their results. Maya assembles her underwhelming team against Zoe's superior group. Amidst their company rivalry, things dramatically change for Maya and Zoe when they discover they're mother and daughter: At sixteen, Maya gave birth to a baby girl, Sarah. Maya couldn't afford to take care of the baby and decided to give her up for adoption (a decision that made her question her credibility as a parent with Trey). Anderson would later adopt Sarah and renamed her Zoe Franklin. Zoe wanted to search for her mother but gave up when there weren't enough clues to go on. Anderson kept the search and eventually found Maya (due to Dilly enhancing her social media presence). Anderson decided to hire Maya to see how Zoe would react around her, setting the stage for an unlikely family reunion. Although Maya is happy to be reunited with Zoe and establish a relationship, she remains fearful that her falsified life will come out and spoil Zoe's perceptions of her. Over the next three months, Maya and Zoe bond as mother and daughter and become more friendly rivals in developing their new products. However, a sleazy development executive, Ron Epson (Freddie Stroma), has suspicions about Maya and investigates into her past. Maya and her team struggle to develop her product, but none of their attempts are feasible for consumer use. At a company gala, Ron makes it clear he's onto Maya, and her former boss, Mr. Weiskopf, recognize her. While trying to avoid Weiskopf and outsmart Ron, Maya finds inspiration for her product: her late grandfather was a World War II soldier that found a surviving Silver Ginkgo tree at Hiroshima. He collected some cuttings and grew one into a bonsai tree for his wife, which was then passed down to Maya. Maya realizes that tree is naturally radiation-resistant and would be the ideal ingredient in their new organic beauty cream. At the project deadline, Zoe modifies two of their brands to be more organic, while Maya presents an All-In-One ginkgo cream in a lavish outdoor presentation. The Board votes overwhelmingly for Maya's product and wants her to present it to the industry as F&C's exciting new product. Ron, meanwhile, finally gets proof that Maya is a fake. At the public board meeting, Maya admits the truth about herself before Ron can expose her, but also champions that her ginkgo cream is not a lie. She selflessly gives her hardworking team credit for the product and asks them to finish the presentation as she quietly resigns from F&C. Zoe confronts Maya, hurt and angry by the deception. Although Maya had no intention of leaving Zoe, Zoe leaves her to resume studying art and photography abroad; Maya is crestfallen. One year passes, with many changes. Anderson forgives Maya and maintains friendly relations with her. Zoe goes to London to complete her art studies, while Maya and her girlfriends team up to create a new online shopping company, MondayMomz.com. Taking all her experience from Value Shop, Maya creates an enhanced online shopping system (with the help of Dilly) that becomes successful. Weiskopf sees Maya's true value and becomes a co-investor in her business project. Trey returns to Maya's life, with Maya promising to be more honest about herself, and open to starting a family with him. Maya actively writes to Zoe about her feelings and experiences during their time apart, and Zoe decides to forgive her. The film ends with Maya and Zoe deciding to start over as mother and daughter once again. In June 2017, Jennifer Lopez signed on to star. In October 2017, Leah Remini, Annaleigh Ashford, Vanessa Hudgens, Dan Bucatinsky and Freddie Stroma joined the cast of the film. In November 2017, Milo Ventimiglia, Treat Williams, Larry Miller, Dave Foley, Charlyne Yi and Alan Aisenberg were added as well. Principal photography began on October 23, 2017, at Food Bazaar Supermarket in Queens, New York, and continued in The Bronx and Manhattan, including Michael Jordan's Steakhouse in Grand Central Terminal. Filming wrapped on December 15, 2017. On September 21, 2018, Sia was announced as the composer for the original song "Limitless" for the film's soundtrack, produced by Jesse Shatkin and performed by Lopez. On October 9, 2018, Lopez performed the song at the American Music Awards. Second Act was initially scheduled to be released in the United States on November 21, 2018, but in September 2018, following "incredible" test screenings, its distributor STXfilms moved it to December 14, and then again to December 21, 2018. The studio spent $19–30 million on promotion and advertisements for the film. Second Act grossed $39.3 million in the United States and Canada, and $33 million in other territories, for a total worldwide gross of $72.3 million, against a production budget of $16 million. In order to break-even, the film needed to gross an estimated $30–40 million. In the United States and Canada, the film was released alongside Aquaman, Welcome to Marwen and Bumblebee, and was projected to gross $9–13 million from 2,607 theaters over its five-day opening weekend. The film made $2.5 million on its first day, including $515,000 from Thursday night previews. It went on to debut to $6.5 million for the weekend, finishing seventh at the box office. It then grossed $1 million on Monday and $3 million on Christmas Day, for a five-day total gross of $10.6 million. In its second weekend, the film increased by 11%, grossing $7.2 million. On review aggregator Rotten Tomatoes, the film holds an approval rating of 44% based on 96 reviews, with an average rating of 4.98/10. The website's critical consensus reads, "Second Act proves Jennifer Lopez remains as magnetic as ever on the big screen; unfortunately, the movie's muddled story isn't always worthy of her gifts." On Metacritic, the film has a weighted average score of 46 out of 100, based on 27 critics, indicating "mixed or average reviews". Audiences polled by CinemaScore gave the film an average grade of "B+" on an A+ to F scale. Michael Phillips of the Chicago Tribune gave the film 2 out of 4 stars, saying: "Good cast, nearly hopeless script. Second Act hinges on a significant reveal around the midpoint, and it's a lulu in the worst way—preposterously coincidental, outrageously contrived." Several reviews highlighted the similarities between Second Act and the 1988 drama Working Girl. Critic Nell Minow wrote that Second Act was an anti-educational inversion of Working Girl. ^ a b c "Second Act (2018)". Box Office Mojo. Retrieved February 17, 2019. ^ Busch, Anita (June 22, 2017). "Jennifer Lopez Boards STX's 'Second Act' With Director Peter Segal". Deadline Hollywood. ^ Busch, Anita (October 10, 2017). "Leah Remini Has Joined Jennifer Lopez In STXfilms' 'Second Act'". Deadline Hollywood. ^ N'Duka, Amanda (October 17, 2017). "Vanessa Hudgens & Annaleigh Ashford Board Jennifer Lopez-Starring Film 'Second Act'". Deadline Hollywood. ^ Hipes, Patrick (October 26, 2017). "Dan Bucatinsky Joins Jennifer Lopez-Starrer 'Second Act'". Deadline Hollywood. Retrieved November 3, 2017. ^ N'Duka, Amanda (October 27, 2017). "Skyler Bible Joins 'First Man'; Freddie Stroma Cast In 'Second Act'; Jonathan Goldsmith Boards 'Mamma Mia' Sequel". Deadline Hollywood. Retrieved November 3, 2017. ^ N'Duka, Amanda (November 1, 2017). "'This Is Us' Star Milo Ventimiglia Joins Jennifer Lopez In 'Second Act' From STX". Deadline Hollywood. Retrieved November 1, 2017. ^ Busch, Anita (November 3, 2017). "Treat Williams, Larry Miller Join Cast Of STXfilms' Romantic Comedy 'Second Act". Deadline Hollywood. Retrieved November 3, 2017. ^ Lee, Ashley (November 7, 2017). "Dave Foley Joins Jennifer Lopez Rom-Com 'Second Act' (Exclusive)". The Hollywood Reporter. Retrieved November 8, 2017. ^ N'Duka, Amanda (November 8, 2017). "Charlyne Yi Boards 'Second Act'; Molly Ringwald Cast In YA Film 'Kingfish'; Robert Scott Wilson Joins 'Relic'". Deadline Hollywood. Retrieved November 8, 2017. ^ N'Duka, Amanda (November 13, 2017). "Evan Handler Cast In 'Foster Boy'; Alan Aisenberg Joins 'Second Act'; Nicholas Galitzine Boards Pippa Bianco film". Deadline Hollywood. Retrieved November 20, 2017. ^ "Jenny From The Value Shop! Jennifer Lopez sports a budget supermarket vest as she larks around with BFF Leah Remini on first day of filming Second Act in NYC". DailyMail. Retrieved October 24, 2017. ^ Calvaro, Liz (December 15, 2017). "Jennifer Lopez and Vanessa Hudgens Celebrate Final Day of Shooting 'Second Act' -- Watch". Entertainment Tonight. Retrieved September 7, 2018. ^ Lyndsey Havens (September 10, 2018). "Jennifer Lopez Performs 'Limitless' at the 2018 American Music Awards: Watch". Billboard. Retrieved September 10, 2018. ^ Anthony D'Alessandro (September 10, 2018). "Jennifer Lopez Romantic Comedy 'Second Act' Heads To The Heart Of The Holiday Season". Deadline. Retrieved September 10, 2018. ^ "Second Act". Box Office Mojo. Retrieved October 21, 2018. ^ a b c d D'Alessandro, Anthony (December 26, 2018). "'Aquaman' Unwraps $22M+ On Christmas For $105M+ Cume; 'Holmes & Watson' Opens To $6M+; 'Vice' $4M+". Deadline Hollywood. Retrieved December 26, 2018. ^ McClintock, Pamela (December 18, 2018). "'Box Office Preview: 'Aquaman,' 'Mary Poppins Returns' to Lead Christmas Crush". The Hollywood Reporter. Retrieved December 18, 2018. ^ D'Alessandro, Anthony (December 18, 2018). "'Aquaman' Darting To $120M+ In Competitive Christmas 5-Day Corridor – Box Office Preview". Deadline Hollywood. Retrieved December 18, 2018. ^ "Second Act (2018)". Rotten Tomatoes. Retrieved March 12, 2019. ^ "Second Act reviews". Metacritic. Retrieved March 12, 2019. ^ Phillips, Michael (December 20, 2018). 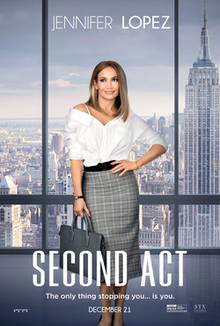 "'Second Act' review: Jennifer Lopez scams her way to the top, 'Working Girl' style". Chicago Tribune. Retrieved December 20, 2018.